Sometime last fall, Farm Burger, the Decatur restaurant that preaches the good word about grass fed beef and respecting where your food comes from, decided to expand to a second location in the heart of Buckhead. Even though my visit to the original Farm Burger location had produced less than stellar results, I was still curious to see if that foray had been an overcooked fluke. Taking a break from Christmas shopping and braving the watery weather, I stopped by the new Farm Burger in the middle of their lunch rush. Lunch rush or not, the staff at Farm Burger handled the crowds with ease and it wasn’t 10 minutes before I went from the back of the line to seated and waiting for my order, but before I could delve back into the world of grass-fed beef, an order of pimento cheese fries with pickled jalapenos was brought to my table. 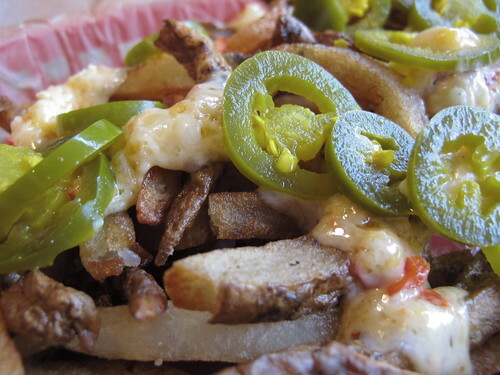 I have to admit I was disappointed to see the pickled jalapenos had just been slapped onto top of the fries. I had hopes of them being minced and a part of the pimento cheese, but no matter. 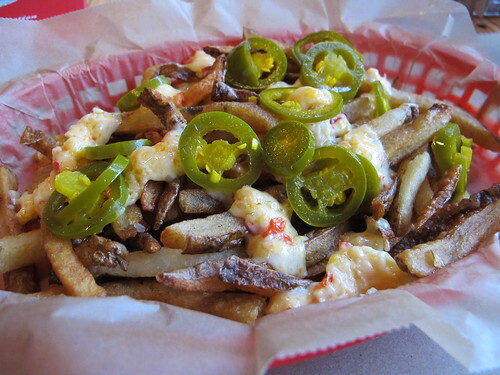 While the fries were limp and pretty insipid, the combination of pickled jalapenos and well melted pimento cheese turned out spectacularly. This one two punch of richness and spiciness did come with a narrow window of opportunity as the cheese quickly turned clumpy, but when hot, it was pretty damn good. 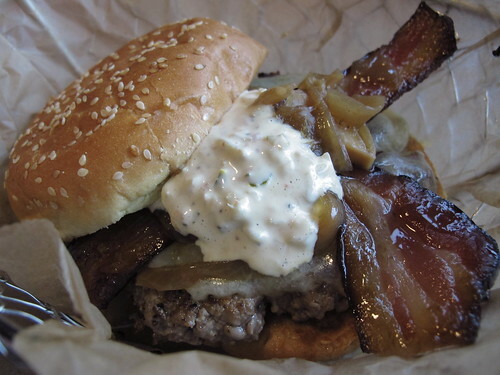 Since I ordered my own burger topping combination the last time, I decided to try No 1 The Farm Burger to see just how well Grafton smoked white cheddar, caramelized onions, FB sauce, and local bacon would work together. I’m happy to report that this burger far surpassed my experience at the Decatur location as this burger was juicier, but it was still missing the big beefy flavor and well seared crust that I was hoping to find. 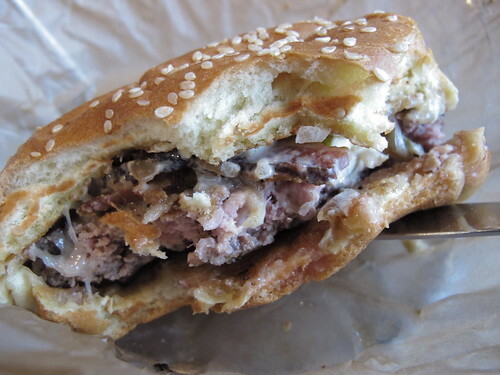 One reason this burger was so much juicier and moister than the first was due to the FB sauce and caramelized onions. These two toppings did the lion’s share of keeping this burger rich while the thick local bacon added a nice dimension of smokiness. Even though this second time had far outweighed the first, I couldn’t help but wonder why the burgers at Farm Burger were completely overcooked. Fortunately, the good people behind Eat It, Atlanta offered some startling insight into the cooking habits of the Farm Burger kitchen staff. After being seared, smashed, baked, smashed, flipped, smashed, smashed again, and broiled with cheese, it’s no wonder that these grass fed burgers had given up the ghost. Sadly, I once again left Farm Burger feeling more than a little bit disappointed. I love the idea behind the restaurant, particularly the celebration of well-reared beef, but there are simply better burgers to be had in Atlanta.